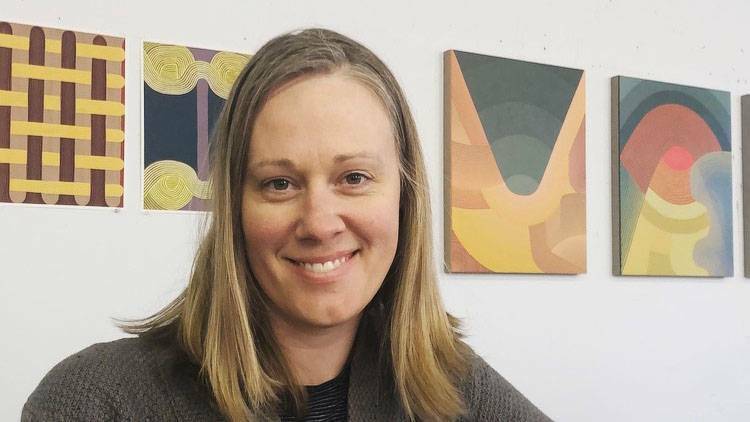 Originally from rural Wisconsin, Jenny Kemp attended the University of Wisconsin-Madison for her undergraduate degree in Art and then lived in Denver and Seattle. She came to the Capital Region in 2009 to get her Master of Fine Arts (MFA) degree in painting from the University at Albany. Jenny and her husband, Kevin, opened a brewery in Troy called Rare Form in 2014. She also teaches art at various educational institutions in the region. Jenny lives in Troy with her husband, 3-year-old son, and their cat. She enjoys traveling, gardening, reading, films and, of course, painting! 1. How did you start painting? I really got into painting when I started graduate school. I had done some before that but my practice before graduate school mainly involved drawing - albeit painterly - using oil pastels and oil sticks. My professors and peers encouraged me to embrace painting more. 2. What do you enjoy about painting and being a painter? I enjoy the process, from planning out paintings to preparing canvases. I enjoy both the solitude that this brings, and also the way an artwork can connect to a larger community. 3. What are some of the challenges in what you do? Finding time to dedicate to the studio with a toddler, ha! 4. Who/what are your biggest influences? My first real art crush was Egon Schiele, whom I was introduced as a freshman in college. His graphic line and abstraction of form was a big influence to me, formatively. More currently I’m influenced by early modern abstract painters like Arthur Dove, Agnes Pelton, Hilma af Klint as well as more recent painters like Bridget Riley, Sascha Braunig, Thomas Nozkowski. 5. And what brought you here? Graduate school brought us out here. The amazing community keeps us here. You can watch Jenny's story on an upcoming episode of AHA! A House for Arts - Wednesday, May 1.